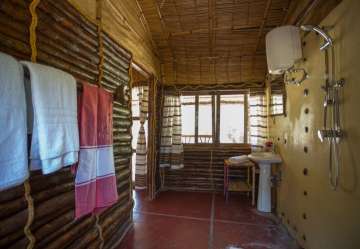 Staying at the Hara Langano, Holiday Lodge in Ethiopia will make you feel like you are at one with nature. Each room, or gojo as they are known locally, is secluded giving you your own personal piece of paradise. Surrounded by ancient forest; you will quickly leave behind the bustle and commotion of urban life. Our attentive, English speaking staff provide room service leaving you to enjoy your private surroundings. 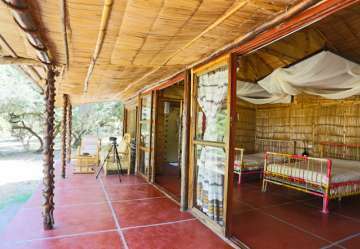 Many of the rooms are lakeside and you’ll be able to watch the tropical sun drop below the horizon as you relax on your own veranda. You’ll be able to watch the natural environment and the local wildlife from the comfort of your own room. With rare, endemic birds frequently spotted in the grounds and hippos visible as they enjoy a recently landscaped section of lakefront. After the sun goes down the lodge is sensitively lit with lanterns, giving it a romantic air and all guest are given their own lanterns. Being so far from any built up areas and with such clean air you’ll be treated to an incredible starscape from the terrace of your room. 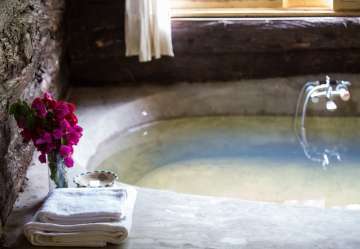 As easy as it is to slip into a simpler, more natural, way of life staying at the lodge we’ve made sure that modern comforts are still available, reliably. Rebuilt in 2014, you can rest assured that you’ll be staying in contemporary facilities that are thoughtfully designed and environmentally conscious. All rooms are en suite with modern high pressure showers. We have a powerful solar array and battery system that provides our main source of power, but we still have a quiet generator to ensure that the electricity supply is on 24/7. The lodge has a good mobile and mobile data signal.